Wind Point Lighthouse (or Windpoint Light Station) is a lighthouse located at the north end of Racine Harbor in the U.S. state of Wisconsin. It is in the village of Wind Point, Wisconsin, on Lighthouse Road, next to the Shoop Park golf course. The lighthouse stands 108 feet (33 m) tall. 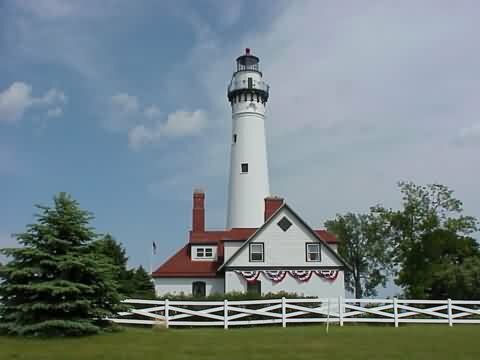 One of the oldest and tallest active lighthouses on the Great Lakes. Wind Point Lighthouse was designed by Orlando Metcalfe Poe and constructed in 1880. The beacon was originally powered by a three-wicked kerosene lamp, magnified by a third-order Fresnel lens. The light was electrified in 1924, and replaced by a DCB-24R airport beacon in 1964. The DCB-24R failed in 2007, and was replaced by a VRB-25 lens. A signal house (horns removed, resonators still in place) remains on the grounds as well as a garage, two storage buildings, and an oil house. The Village of Wind Point has maintained the lighthouse and grounds since 1964, and uses the old keepers' quarters as a village hall and police headquarters. In the summer of 2007, the lighthouse tower underwent a US$210,000 restoration, during which windows and doors were replaced, brickwork repointed, and the tower repainted. The lighthouse interior is not open to the public, but visitors can stroll the grounds and enjoy the view. Stay on Route 32 for an additional 1.3 miles. At that point Route 32 goes to the left. Continue STRAIGHT onto N. Main St.
Take N. Main St. for 1.6 miles then turn right onto 3 Mile Rd. Go on 3 Mile Rd. for about 1.1 miles. You'll go through a golf course then see the lighthouse on the right. Turn at the sign for the Wind Point Police Dept. (they have an office at the lighthouse).